We got out of the Holler for Christmas and met some folks we hadn’t seen since our days in Kyiv. Unlike many, they were quite aware of what had been going on with EuroMaidan. Their sincere question was “How is all this affecting the people you’ve known for all these years?” The question is probably posed to find out how these disruptive and disturbing events might be endangering, or at least inconveniencing, these folks and their churches. However, with just a moment’s reflection, my response reflected what I believe is a deeper significance and, I hope, impact of the ongoing protests in Ukraine. While there are economic and geopolitical elements at play (and which served as the spark that lit the fuse) the driving fuel which has kept these protests simmering is about justice and morality: what is and isn’t right and what a people needs to truly be free. These are not a bunch of trouble-makers… these are people peacefully claiming their right to see their children grow up as worthy citizens of a decent nation. They sing the National Anthem (“Ukraine has not yet died…”) practically every hour, and regularly seek the blessing – and mercy – of the Eternal on themselves and their country. 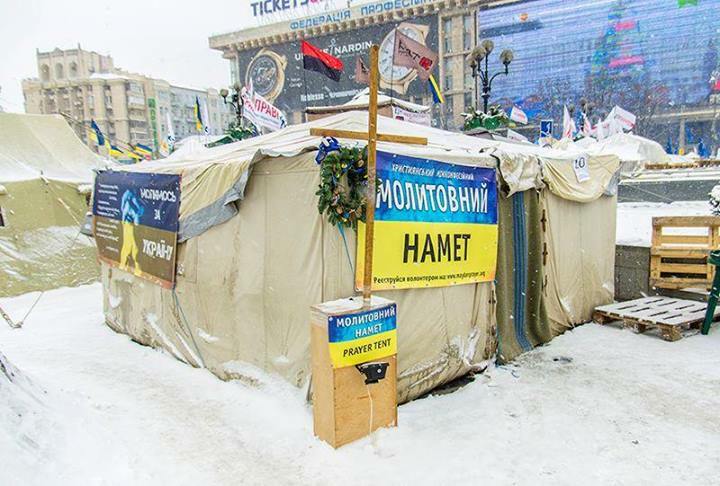 The hallmark of the protests is the tent encampment in Independence Square, Maidan Nezhalesnosti. One of these tents is a Prayer Tent, being staffed by members of all Christian confessions, including the pastors of churches we know well. Many of our friends have visited and prayed there; practically all describe a great sense of spiritual openness. There is no need to try to “inject spirituality” into current events in order to “witness”: While there is a lot of diversity as to what it all means, there is a deep sense that what is needed – and what may, at last, be at hand – is a spiritual awakening. 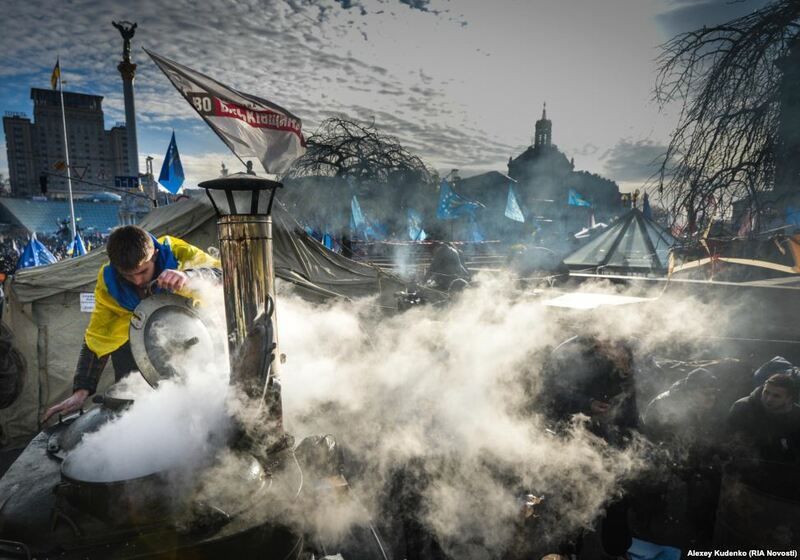 The political future of the nascent “Maidan” movement may be rough, largely because of the lack of unified leadership. What we see the body of the faithful providing on Maidan may be precisely that for which the country has the greatest need. Servants of Christ and the common good who see the fostering of civil virtue and social justice as inextricably connected to the sharing of the good news that God is here and is accessible and responsive to prayer. 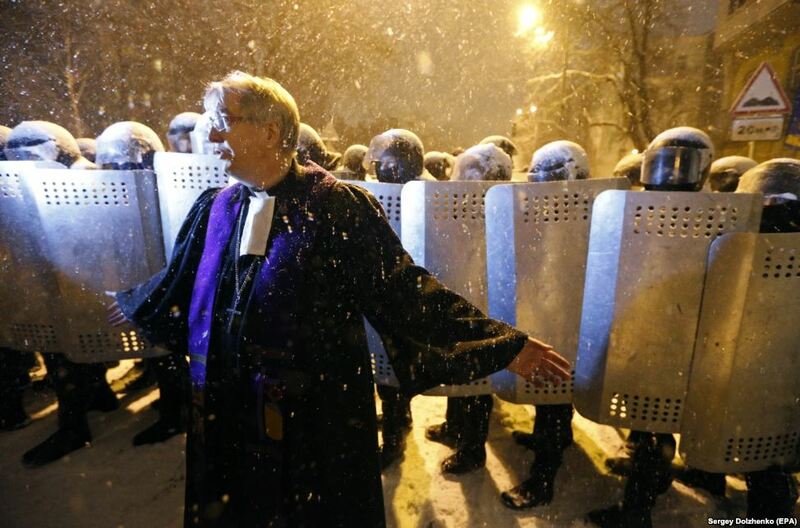 The bells of St. Michael’s Cathedral rang out in the early hours as riot police began a spirited attempt to literally push the people out of Independence Square. The last time they had been rung in alarm was around 1240… not 1240AM, but 1240 AD, when the city was facing the invasion of the Mongols. By the time the sun shone down on the center of town tens of thousands of citizens had gathered to solidify the people’s grasp on their piece of Free Ukraine. Not because a celebrity or leader told them… but because the bells rang… and they heard. If those who follow Jesus can come together and provide servant leadership, fueled by prayer, inspired by love of God and a commitment to justice which seeks the greater good of the community and the growth, strength and health of the spiritual community above their own confession or denomination, who is to say that it would not provide the one piece that is missing to make this opportunity the occasion to truly give birth to a nation? A unified, spiritual and moral leadership to step into the current vacuum created by the moral collapse of the powers that be. A renewed Ukraine that is moving toward Europe can be a blessing that could stimulate spiritual renewal throughout the continent. So what is at stake is not only the dignity and wellbeing of the people of Ukraine and their nation . “Europe needs the great gift of Ukraine.” As this New Year begins, I pray for my family, near and far. I pray that justice and peace may prevail in our own hearts, our own families, our own communities, and our world. And we pray for the transforming presence of Christ to reanimate us, individually and collectively.